Try to find another condo like this one at this price! This cute as a button condo has so much going for it. Easy care tile in living room, hall, kitchen and baths. Master bedroom with sliders to patio with privacy wall. Master bath and guest bath have been partly remodeled. Screened lanai with a separate garden within the lanai. The garage is extra large with a new door & opener March of 2013. Whole unit replumbed in 2006. Great location on a cul-d-sac. Pet friendly. Rentals permitted with a 90 day minimum. $1,500. transfer fee to SCC. Yearly dues $269. per person. This is an outstanding value. HOA fee includes insurance on the exterior of the building, water/sewer, mowing, and irrigation. Furniture is optional. SELLER WANTS AN OFFER! 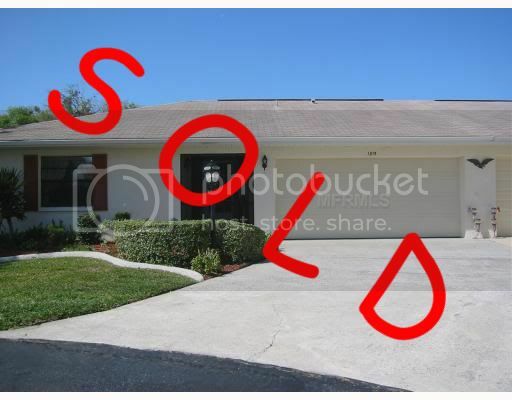 LOOKING FOR A FURNISHED HOME OR A WARM $ SUNNY PLACE TO SPEND THE WINTER OR BE A FULL TIME FLORIDA RESIDENT? THEN THIS IS IT!UNIT IS COMPLETELY FURNISHED WITH A NEW SLIDING GLASS DOOR TO THE SCREENED LANAI.COVERED PARKING.BASIC KP APPLIANCE WARRANTY. LOCATED IN THE GATED 55+ COMMUNITY OF KINGS POINT. YOUR MONTHLY ASSOCIATION FEE TAKES CARE OF YOUR PROPERTY OUTSIDE WHICH MEANS MORE LEISURE TIME FOR YOU TO SPEND AT EITHER OF THE TWO BEAUTIFUL CLUB HOUSES WITH HEATED POOLS, SAUNAS, EXERCISE ROOMS AND OVER 200 CLUBS TO JOIN. COME TO KINGS POINT AND FALL IN LOVE WITH THE CASUAL LIFESTYLE! This unit can also be rented seasonally at $1,100 per month. Tenant pays Electric and Landlord pays Basic Cable, Water & Sewer, Clubhouse dues, and Lawn Maintenance. 12% tax applies if rented less than 6 months and 1 day. BEAUTIFUL, CAREFREE CONDOMINIUM ON CUL-DE-SAC CONVENIENTLY LOCATED NEAR GOLF AND RACQUET CLUB AND COMMUNITY RECREATION CENTER. A 55+ AGE RESTRICTED COMMUNITY WHERE FOR ONLY $256/YEAR/PERSON, YOU CAN ENJOY ALL THE AMENITIES OF SUN CITY CENTER. THERE IS A A ONE-TIME TRANSFER FEE OF $1,200 FOR NEW RESIDENTS. CONDO FEES PAID QUARTERLY OF $240 WHICH INCLUDES LAWN CARE,TRIMMING BUSHES,SPRINKLER MAINTENANCE, LIABILITY INS.ON OFFICERS/BLDG, ESCROW RESERVE. QUIET & PEACEFUL AREA. Freshly painted inside April 2011. Beautiful unit with many upgrades and handicap accessible. New kitchen cabinets, reverse osmosis filtered drinking water system, shower in master bath with handicap bars & roll-in wheelchair access, Glass enc. lanai with golfcart doors. Attic access in MB with pull down ladder and floored for extra storage. Stack Maytag Washer & Dryer. Folding screen at front door. Investor's Delight Tenant in place until 12/20/11. Don't miss seeing this jewel today!! PRICED LOW FOR QUICK SALE! MOVE RIGHT IN: Two bedroom/two bath, single car garage with additional room for a golf cart, patio, serene view, friendly owners living in a cluster of homes.Pet friendly area. CLEAN,partially furnished. New Heat Pump, Air-Conditioner & Humidstat in 2009. Spacious eat-in kitchen with nice appliances, Owners selling due to illness. Golf Carts are a second mode of transportation in this 55+ retirement community with over 200 clubs & activities, numerous golf courses both public & private, indoor & outdoor pools and a new 6000 sq. ft. state of the art Fitness Center. Tampa, Sarasota,& St Petersburg close by with many cultural & sporting events. Award winning beaches and Orlando amusement parks are just a short drive away. A 2bd, 2ba, Oxford Model Villa Home features an air-conditioned utility room with room for golf cart storage. There's an Enclosed Lanai with air conditioning as well! The Master bedroom has a large walk-in closet and a private bathroom. It's located in King's Point. Light and bright lovely furnished 2/2 Stuart model with enclosed lanai, inside utility room and a golf cart garage W/electric garage door opener. Spacious master suite has a walk-in closet with king size bed.Enjoy all the ammenities of Kings Point..Two Clubhouses, indoor and outdoor heated pools, fitness centers, arts & crafts, library, and over 200 clubs & activities. Why be cold up North when you can have a beautiful furnished villa in "Sunny Florida" for only $50,000? This wonderful unit is also for rent at $750. Furnished 2 BR 2BA with large glass enclosed Florida room approx. 15'X17'. Golf Cart is included and can be parked in the Florida room that has golf cart doors. Wood floors in hallway and second bedroom. Just bring your suitcase and toothbrush and enjoy the lovely Florida weather sitting on the glass/screened Florida room. This unit can also be rented for $700 a month Annual rate or $1,000 Seasonal rate or leased with the option to purchase. Cozy winter retreat or year around residence in Florida's premiere retirement community. LIGHT AND BRIGHT CAPE COD MODEL FEATURES OPEN FLOOR PLAN, CATHEDRAL CEILING, LIVING/DINING ROOM COMBO, SPLIT BEDROOMS, INSIDE UTILITY ROOM, SCREENED LANAI AND A GARAGE. LOCATED ON A CORNER LOT. THIS EXCEPTIONAL "EXPANDED GLOUCESTER" UNFURNISHED MODEL IS LOADED WITH EXTRAS LIKE TILE AND LAMINATED FLOORING. 4 "SOLA" TUBE SKYLITES. UPGRADED APPLIANCES, CEILING FANS, ROCKER SWITCHES, TILE BACKSPLASH, 6 PANEL DOORS, POCKET DOOR TO MASTER BATH. SCREENED ENTRY AND SCREEN SLIDERS ON GARAGE OPENING, NEW SINK TOPS AND FAUCETS ON BOTH BATH VANITIES. EXTRA STORM SUPPORTS ON GARAGE DOOR. NEW A/C. NEW GLASS ENCLOSED 5X18 LANAI ON BACK. GREAT INVESTMENT PROPERTY! Seller Motivated! Bring all offers! LOVELY 2/2 HOME W/ENC. & SCREENED LANAI, & ONE CAR GARAGE. FURNITURE CAN BE PURCHASED FROM SELLER. @$1,600 SEASONAL RATE. $256 ANNUAL FEE PER PERSON AND $1,200 ONE TIME TRANSFER FEE TO SUN CITY CENTER COMMUNITY ASSOC. One of a kind property located just two hidden blocks from the new Super Walmart & Publics grocery store. Spacious 5 BR, 3.5 BA, 20X40 Pool, Dog /run, oversized garage, two outbildings-storage shed & office with electric, water, A/C & bathroom. Mature trees include citrus exotic sausage trees and many other trees & plants. Perfect property for a Bread & Breakfast facility or secluded for an artist retreat. Upstairs could be a Mother-in-law apartment or rental possibility. Lots of room for private parking on circular driveway. Acreage can be developed. Three small ponds W/fish & wildlife on property. Public water plus deep well. House has tile & carpeted floors, built-in china cuboard & storage in dining room, newly painted, new roof, safety film on windows, wood burning fireplace, all appliances included along with some furniture. Owner will finance with reasonable down payment. Call Brenda White @ 813-634-1000 to see this unique property today!